The Union Station Redevelopment is coming along quickly. The Light Rail is now 78% complete and the overall project is 38% complete! The huge piles of dirt have shrunk significantly as they have been used for backfill against the bus box. The digging has started on the historic station side of the bus terminal. 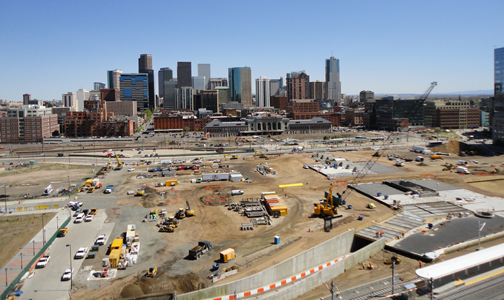 The passenger tunnel that helped bring commuters from Light Rail to Wynkoop Street started being demolished this week. Additionally, the public plaza design has been submitted and the final approval meeting will happen on May 17th.